Alan Stubbs has urged Hibs to focus on sealing their play-off berth before turning their attention to finishing second in the Championship. While the Easter Road side have established themselves as favourites to land the runners-up slot behind Hearts, their head coach is intent on treating the run-in on a game-by-game basis, with his first objective to make sure that his side can’t be knocked out of the top four. 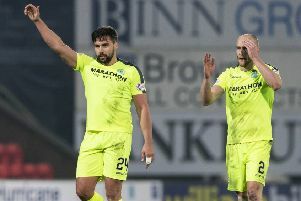 With eight league matches remaining, Hibs sit 12 points clear of fifth-place Falkirk, who have a game in hand. Hibs host third-place Rangers on Sunday knowing that even if they lose they will still be in second place. Stubbs insists he is taking little notice of the Glasgow side’s travails and is instead fully focused on ensuring his own team maintain a seven-game winning streak. “For me, it was irrelevant how many points we were ahead of or behind Rangers going into the game,” said Stubbs. “It’s just a chance to play one of our main rivals at home and get a good result against them. We’ve set ourselves up nicely for the game, but it’s irrelevant what the teams around us do.